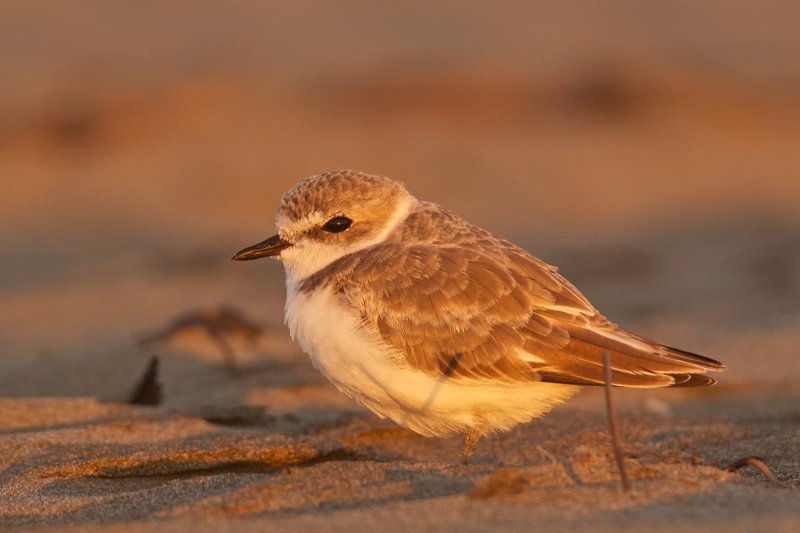 Plovers on both coasts are in trouble! Strolling at sunset along the ocean beach at California's Morro Bay or Washington's Leadbetter Point, you hear a male Snowy Plover. At Milford Point in Connecticut, you might hear a Piping Plover. 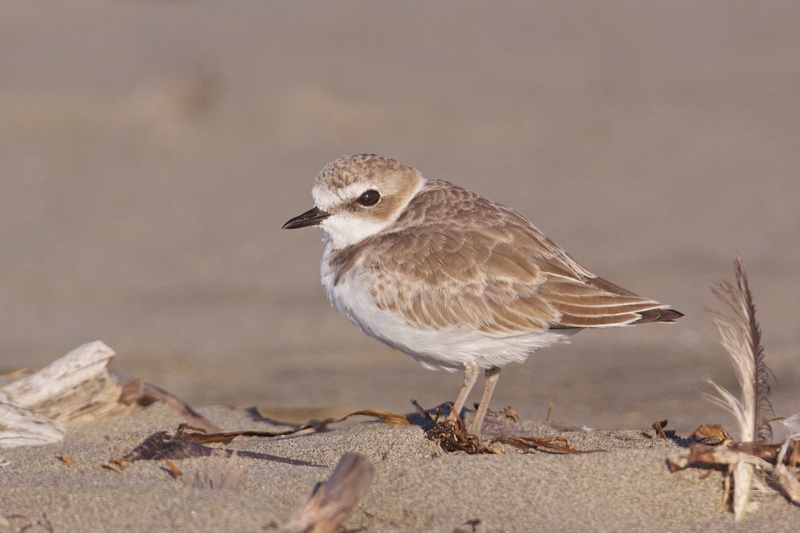 Plovers are threatened in much of their coastal ranges. 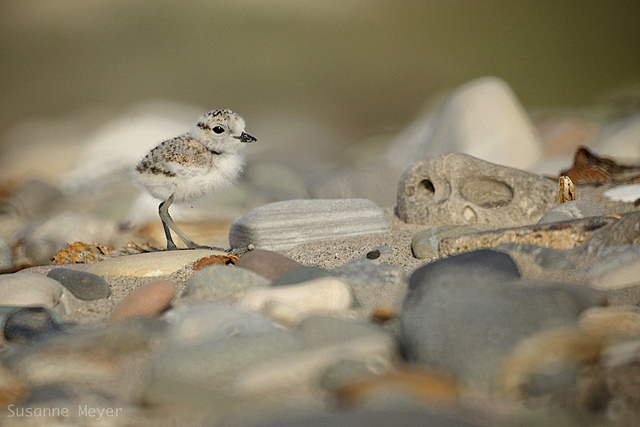 Conservation efforts are afoot on the Atlantic Coast to protect Piping Plovers, and on the Pacific Coast to protect Western Snowy Plovers, like this chick. Official signs ask you to stay out of the dunes, to protect plovers and their nests, and this small act can help. Strolling at sunset along the ocean beach at California’s Morro Bay or Washington’s Leadbetter Point, you hear a soft, whistled call from the beach-grass nearby. [Snowy Plover call] A male Snowy Plover announces his presence. At Milford Point in Connecticut, you might hear a Piping Plover [Piping Plover call]. Suddenly, a pale, six-inch plover runs across the evening sand like a high-speed wind-up toy. Just as quickly, the bird disappears, concealed by its camouflage. Plovers are specifically adapted to lay their eggs in shallow “scrapes” in the sand, lined with bits of shell, pebbles, and grass. This unfortunate nesting niche means that the birds are highly vulnerable to disturbances by people, dogs, cars, and impinging development. 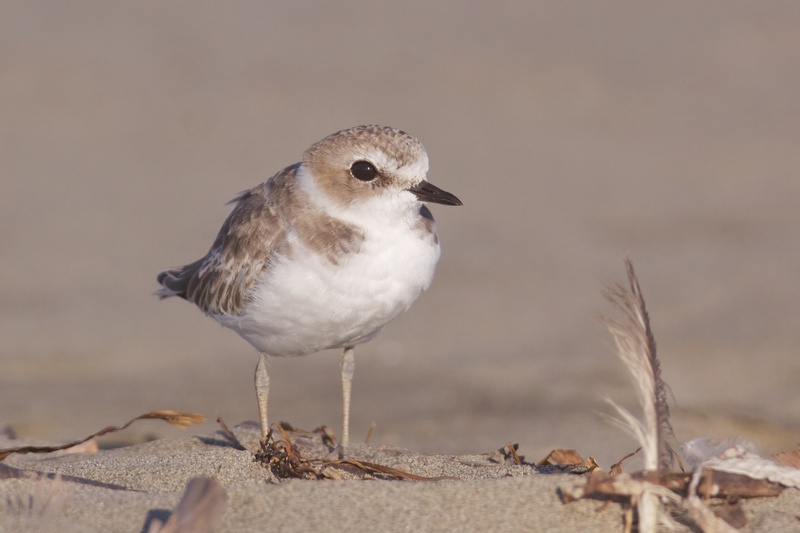 Conservation efforts are afoot on both the Atlantic and Pacific Coasts to protect these plovers. Find out more on our website, BirdNote.org. I’m Mary McCann. Calls of the plovers provided by The Macaulay Library of Natural Sounds at the Cornell Lab of Ornithology, Ithaca, New York. 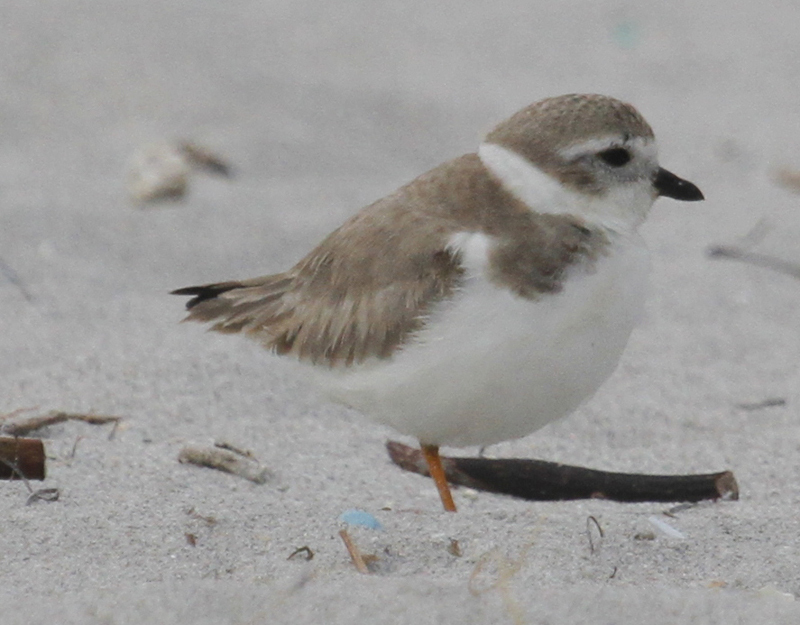 Snowy Plover recorded by G.A. Keller; Piping Plover by Dolly Minis. Ambient track provided by Kessler Productions.